How do you follow a post like the last one? I’m still in shock over the loss of my friend and I hardly know what to think. My first idea was to share a funny story from work yesterday, but I jotted it down on a sheet of paper and then forgot to bring the write-up home with me, so that lighthearted interaction will have to wait until tomorrow. It will have the honor of closing out NaBloPoMo. Until then I’ll share something else that’s upbeat. Especially since I need to finish my Disney race recaps before they completely disappear from my mind. The Thor 10K took place at Disneyland on November 11th. The theme of the Avengers 10K changed each year depending on which Marvel movie has most recently been released or is up next in theaters. In 2015 when the 10K was born it was the Captain America 10K (the race was held between “Avengers: Age of Ultron” and “Captain America: Civil War.”), and then in 2016 it was the Doctor Strange 10K (“Doctor Strange” was released about a week before the race). This year we got the Thor 10K due to its proximity to “Thor: Ragnarok.” (I actually went to see it in the theater on opening day when I was in Orlando and I really enjoyed it. More humor than your average Marvel film. I’m already looking forward to the 2018 releases.) I do like the rotating theme because it gives us some variety on our race shirts. I woke up at 3 AM the morning of the race, quickly got dressed, and walked from my hotel to the start line. 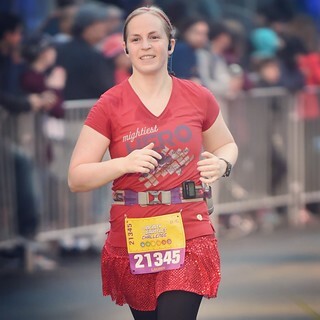 Our course I selected my Thor running shirt for the occasion, and I paired it with a red skirt. It was another opportunity for me to run without having to apply sunscreen since the race started at 5 AM. Perfect! I didn’t break any speed records during the 10K, but I was happy with my pace and I thoroughly enjoyed the 6.2 miles through the Disneyland and California Adventure parks. At the finish line I quickly grabbed by medal and started walking back to my hotel to avoid the rapidly rising sun! I originally intended to have breakfast at LaBrea Bakery at Downtown Disney after a quick shower, but instead I stumbled into the much more conveniently located breakfast buffet at my hotel. Fortunately the food was delicious, especially the exceptionally crispy bacon. I ate more than my fair share. After that I took a lovely nap. Later in the afternoon I walked over to the resort area because I had a dinner reservation that evening. I spent some time in Disneyland taking in the first days of the Christmas decorations before heading over to California Adventure for dinner at Wine Country Trattoria. I had some lasagna in preparation for the Avengers half marathon the next morning. On my way back to my hotel I bought some cupcakes from Sprinkles at Downtown Disney. Their seasonal pumpkin cupcake is one of the best bits of baked goods that I’ve ever tasted. It was the perfect dessert. I was exhausted that night so I actually went to bed at 8 PM, hoping to be well rested when my alarm went off super early the next morning, only to be woken up at 9:30 PM by the nightly Disneyland fireworks. That was annoying, but I still managed to get a good amount of sleep before getting up to run 13.1 miles the next morning. Be on the lookout for the final installment of my 2017 runDisney adventures sometime next week. The Doctor Strange 10K on Saturday was amazing! The 10K distance is definitely my preferred distance, and over the last three years the Avengers races have proven to be my hands-down favorites. That title was successfully defended this past weekend. I rolled out of bed in my hotel room at 4 AM on Saturday morning and got ready for the race. Taking into account my expected finish time and the time of sunrise for that day I decided not to wear sunscreen. Just call me a rebel! I probably should have, but putting it on would have taken time and effort that I wasn’t willing to spend. After walking to the start line I managed to maneuver myself to the front of my corral (C) in order to avoid a lot of dodging and weaving of slower runners and walkers once I got going. Because I’ve had some luck running races at a decent pace lately I had a fleeting idea to go for a 10K personal record. That usually doesn’t work too well at Disney races, but with almost front-row corral placement I was trying to keep the possibility alive. And it worked! 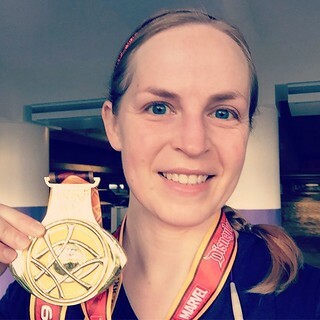 Last Thanksgiving a friend paced me in order to get a 10K time of less than 1:10 (1:09:40, to be exact), but I finished the Doctor Strange 10K in 1:07:01! It felt amazing to get a PR of over 2 minutes! I was still in shock as I walked back to my hotel, with my medal around my neck and a stupid grin on my face. The weekend was starting off perfectly. After a quick shower in my hotel room I drove to McDonald’s for breakfast. I was really hungry after the 10K and only my favorite breakfast would do – Egg McMuffin and a Diet Coke. The Florida vs. South Carolina football game was going to start at 9 AM and I decided to go home and watch it there where I could comfortably lounge on my own couch. I didn’t quite make it home before the game started, but luckily the XM radio in my car allowed me listen to the beginning of the first quarter as I was driving. Continuing the positive nature of the weekend the Gators beat the Gamecocks! This is a better outcome than the Arkansas game that I attended with my family last weekend. The offense actually showed up this week which was a nice change. Let’s hope Florida can keep it up for the rest of the season. After the game I drove back to my hotel in Anaheim and then walked over to Disneyland. It was crowded this weekend so I skipped most of the rides. I did make sure to catch the two movie previews in California Adventure, though – “Doctor Strange” and “Moana.” Both movies look really good and I can’t wait to see them. Before leaving the parks for the evening I had a big pasta dinner (lasagna, to be precise) at Wine Country Trattoria in preparation for the Avengers Superheroes Half Marathon the next morning. A good race starts with a good carb load meal the day before. And in order to set myself up for success on Sunday I walked back to my hotel after dinner and went to bed early. It was going to be a long 13.1 miles in the morning! Yet again I’ve missed a couple more days of my NaBloPoMo commitment. As with the last time, I was away from home, although just in Anaheim for the Avengers Half Marathon Weekend rather than Orlando. A Disney race was still to blame for my lapse. I was just too busy and too tired to post anything on Friday and Saturday. Sorry about that. Luckily the weekend gave me a lot to write about so I’ll recap it this week. I woke up at 3:30 AM yesterday morning for the Captain America 10K. When I’m staying at a hotel near Disneyland I usually don’t get up quite that early, but there were some additional security checks in place for the races after the terrorist attacks in Paris the night before. So I dragged myself out of bed and into the cold morning 45 minutes earlier than I had originally planned. Luckily I’d saved a couple of mylar thermal blankets from previous races so I could keep warm with one of those wrapped around myself until right before crossing the start line. It worked remarkably well. However, the extra security precautions turned out to be pretty simple so I spent about an hour and a half sitting around in the chilly pre-dawn air before I could start running. Without that blanket I would have been really uncomfortable. (What a difference two months makes! In September I was melting at the Disneyland races. November is a huge improvement.) 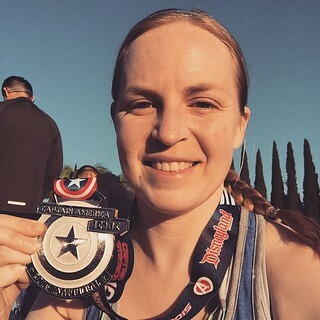 I was in the third corral of runners so I started the Avengers 10K around 5:45 AM. The weather was perfect for running so I pushed myself to go a bit faster than usual and it paid off! It was my second fastest 10K at 1:12:27 (only 42 seconds slower than my personal record). 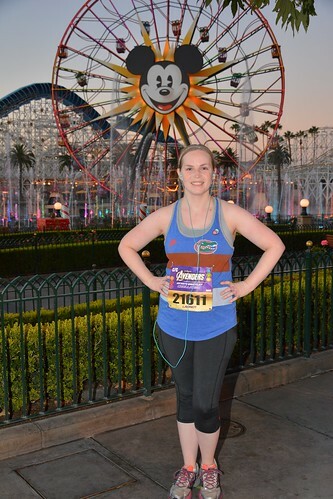 I might have beaten my PR, but I stopped for a photo in California Adventure about halfway through the race. The delay might not have been worth it, but I’ll withhold judgment until I see the picture. After I’d collected my 10K medal (and a new mylar blanket) I stuck around to watch a friend’s daughter run the 100M kids race. It was so adorable! The Florida vs. South Carolina football game started at 9 AM that morning. I missed most of the first quarter while I was watching the Avengers Kids Races, but it was worth it. As a loyal fan I wore a new Gator tank top (my parents gave it to me in Florida last week) during the 10K, as well as a Captain America pin to honor the race’s namesake. Superhero-themed races are no excuse to not support your team! I actually cancelled a brunch reservation at Carnation Cafe in Disneyland to stay in my hotel room and watch Florida’s last SEC conference game of the season, but the whole scenario kind of went awry, much to my dismay. First of all, ESPN was out of commission on the TV in my room. The whole entertainment system was a little finicky, but all of the ESPN channels were completely frozen. This annoyed me greatly, and I gave some poor guy at the front desk an earful on the subject. Luckily the hotel wifi was fast enough for me to stream the game on the WatchESPN app on my iPad. (Last weekend I watched part of the Florida vs. Vanderbilt game on the same app on my iPhone while in line for a ride at EPCOT. The wifi at Disney World is outstanding!) The Gators ended up winning the game, but not without a bit of an exciting fourth quarter where South Carolina scored two unanswered touchdowns and at one point Florida only had a three-point lead. A win is a win, but this one was much too close for my taste! Luckily the Gators clinched the SEC East last weekend so they already had a spot in the championship game in December. The rest of my Saturday was pretty quiet – I took a nap after the game, walked to Disneyland in the afternoon, had a large bowl of spaghetti for dinner (mediocre, but good pre-race fuel), and finished the evening with a Ghirardelli’s salted caramel hot chocolate. Delicious. I went to bed as early as possible in order to be rested and ready for the race the next morning. Come back tomorrow for my recap of the Avengers half marathon!